Trendy, stimulating and so creative! 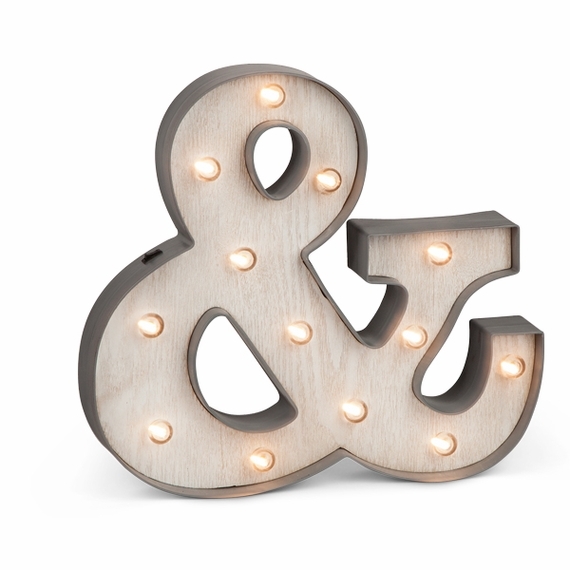 Use our new LED Lighted '&' sign to enlighten your life with positive energy! 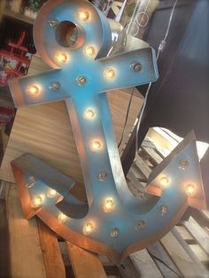 '&' speaks volumes and is a powerful connector, joining single elements together to form a strong, expressive bond! This vogue LED sign is 12" tall, 11" wide and 2" deep with 13 warm white LED bulbs that will stay cool to the touch and will last for many, many hours. The housing of the sign is hard plastic in matte gray and the background has a bleached wood look. There is a keyhole cutout on the back for ease of hanging but this also looks wonderful on a desk, a shelf, a table or on the floor. It's light enough to hang from a magnet hook so decorate your cubicle, file cabinet and work area! It's a unique and fun prop to use in photos, placed between people, people and their pets or hobbies and it's a great device for advertising whatever you wish to communicate! It's motivating, encouraging and it embraces forward movement and hopefulness! The easy access on/off switch is located on the side of the sign. This weighs 2 lbs. and requires 2 AA batteries (not included). We are REALLY excited about the Marquee Signs that we have chosen to sell at ShopWildThings. The market seems to be really flooding with these, but most are CHEESY! We looked at every single LED Marquee Sign, turned it over, held it, checked them out turned on and turned off. We are super proud of the designs that we chose based on craftsmanship and style....and good looking LED lights.